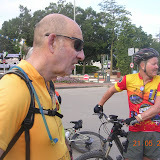 Before the late Ronnie became a dedicated "roadie" he often participated in Cyclenix rides. 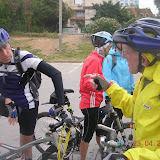 His knowledge of off road trails was extensive and added a new dimension to our activities by arranging and leading us on "away rides" throughout the length and breadth of Israel. Many of the away rides which we do today have a strong basis in "Ronnie's Rides". Ronnie passed away suddenly 3 years ago and our ride today was planned to end at Spingo where we joined the group of road riders of which the late Ronnie was a key member, to be associated with the "Tekes" in his memory and with the tributes paid to him. Bottom Line: Enjoyable and picturesque along the banks of the river (one of the few in Israel that can boast water throughout the year). Ideal weather but as always at this time of the year the last few kilometers the heat up a notch to "turbo mode". Great Company as usual. 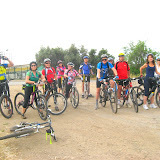 At 7.30am 12 riders met opposite Yad L'Banim for our Weekly Saturday excursion. The sky was a little overcast as we set off West along Ahuza Street naking out way along a well worn route passed the Herzliya Airport. Once we hit the Tel Aviv - Haifa railway line on the Northern side of the airport we back-tracked towards the Herzliya Park. it was then that the odd few drops of rain turned into a steady heavyish drizzle and by the time we reached the Park were were somewhat wet!!! At the point some of the riders turned back, but 10 of us carried on towards the Herzliya Marina, where, on the way we passed participants in the Women's Annual triathlon whjo were taking part in the cycling leg of the event. We carried on Southwards on the cliffs overlooking the Mediterranean making our way back through the fields of Ramat Hasharon and back to the Park at Herzliya where we stopped for our "breakfast". By this tie the rain had disappeared and the sun was shining brightly. The service, food and atmosphere at the cafe in the Park was excellent. From there we set off towards home.It was not only a great ride, companywisew and qualitywise, but we also discovered a new very pleasant "watering hole"... Another 30+ kilometres under our belts. Well, it felt just right to renew my participation in the weekly club rides, after a long period of absenteeism due to various family duties. In a somewhat cool but promising Saturday morning 15 of us showed up at the usual meeting place, and took off northward under David?s direction. After crossing the pardessim of Bazra, we climbed up the Bnei-Zion hills, saw the colonial-style polo grounds and clubhouse where magnificent horses and foals trotted along, then descended and again ascended in a twisting fashion in the Great Sharon Bikegrounds. In short, we repeated the usual Udim-Yaqum-Shfayim route, with some new sidekicks known to David alone, which helped to alleviate the familiarity of the terrain. On the way back we lost John who had to leave early, and after a short but tasty coffee stop in the very pleasant gas station in Gaash, yours truly also had to take off for the so commanded early arrival at home. I trust the remaining group members made it safely home, in what proved to be a relatively brisky ride, in excellent weather. See you all next Saturday. What happened to everyone this morning??? Were you all scared off by an overcast sky? We two people weren't....Frederic and your's truly. We had an enjoyable (and shorter than usual) of approximately 25 kms. stopping off for breakfast at the Service station between Gaash and Shefayim. Until then I had no opportunity of testing out my new rain suit! As we sat down to order, the heavens opened up and it poured until 5 minutes before we were due to head for home. Then the sun came out and off we went. 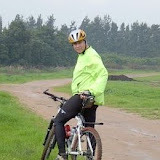 On the way we did get about 10 minutes of rain and I am pleased to say that my rain suit passed the test. It wasn't at all cold and there was really no wind to speak of. All in all , very nice riding conditions and a very pleasant ride. Next time, don't be frightened off by the weather! Weather is as unpredictable as the Bureau that is supposed to predict the weather. The radar said no rain so we got rain...well, sort of if light to drizzle is "rain". It dogged us on and off for almost two hours but in between we dried out so it in fact was a coolant. Not that we needed cooling as the temp was just perfect. The sun shone in between those showers so what more could we ask for. To start with, a great route "hilly" which is what we got going north to B.Zion, the Reserve , Udim, Yaqum and Ga'ash where we breakfasted in two groups. One indoor who had no faith in the rain and those who sided with the Bureau and guess who won out. We were eleven to begin with until Shmuel joined us at Udim. We were also privileged that Shaul our good friend came along. He had the right stuff and we hope to see him again in our ranks as he qualifies...see the following definition when Geva and Yossi joined. But first, let's examine what were the criteria that made our two latest riders come away knowing that they are "Cyclenixable"!! They are willing to get up at ridiculous hours to ride. 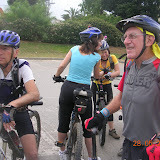 They enjoy the company of fellow riders. They care for their bike. They (if you can add more items, let John have the details) look forward to Ted's reports. The combination of the two says it all - great ride, great company, ideal weather. Well, Spring is definitely here. I hope that you all had an enjoyable holiday. Eight of us (somewhat less than usual, because quite a few of our "regulars" were away on holiday) set off on our excursion at a wee bit after 7.30. The weather was almost perfect. I say "almost" because the was a bit of a wing against us on the homeward stretch. At one time the clouds looked rather threatening (see the photos) but no rain materialised and there was lots of sunshine. Our route was one that we have travelled many times....Along Ahuza street, through the fields opposite the Ra'anana Lake , South to the border of Kfar Shmaryahu along the Tel Aviv/Haifa Railway line, through Rishpon and across the bridge over the Coastal Road and then onto one of my favourite viewing points in the Hasharon Coast Nature Reserve. 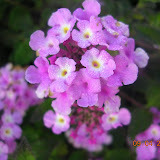 There was lots of colour in the fields. We carried on to Spingo where we made a short stop and were joined my Jules who arrived by Jeep. Pleased to see that he's making good progress after his nasty accident (not a bike accident!) the day before the Cape Argus Race. Hope it wont be long before we see him back the saddle. Thereafter it was back home after a most enjoyable +/-35 km. ride. A little more than a Home Patch Ride - 9.4.11. Here it is, short and sweet. 13 riders (lucky number) met at our usual "Home Patch" meeting place for a ride that was a wee bit more than a home patch ride. We rode West along Ahuza street and made our way through the Herzliya Pituach Industrial area to the Marina and then turned South hugging the coast line. 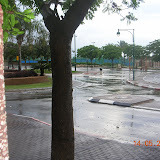 We passed Tel Baruch and Reading carrying on to the Tel Aviv port. From there we travelled along the banks of the Yarkon River, where I noticed the the level of the water was the lowest that I have seen in a long, long time. Attidim and Ramat Hahayal were next on our route, with a refreshment stop at Aroma. Then it was on to Ramat Hasharon, crossing over the the bridge over Highway 5 at the Ramat Hasharon Tennis Centre and back to Ra'anana via Herzliya. 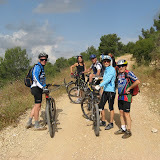 The weather was perfect for riding and we must have covered at least 45 kilometres. All in all, it was an enjoyable ride and good exercise.